Two years ago, if I’d told you that Neal Maupay would be sitting pretty at the top of the Championship goal-scoring charts, you’d have laughed in my face. Mainly because you wouldn’t have heard of him. The Frenchmen made his first appearance as a 16-year-old for OGC Nice in the 2012/13 season and went on to score 9 goals in 53 appearances. This surprisingly earned him a transfer to the high flying Saint-Étienne for a fee of €500,000. The move was surrounded by much controversy as the youngster was hardly prolific for Les Aiglons. Despite this, he still caught the eye of manager Christophe Gatlier, who swooped in to sign him on a four year contract. 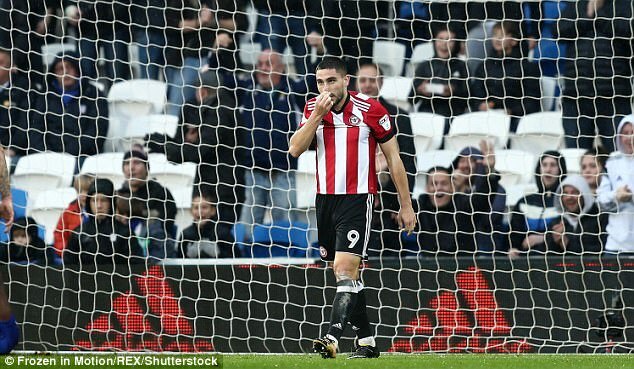 Gatlier’s faith in the youngster came with little reward, as Maupay only managed 3 goals in 23 appearances in the 2015/16 season. This meant he was shipped out on loan to Brest in Ligue 2 for the whole of 2016/17. There, he did manage to re-demonstrate his eye for goal that earned him his move to Saint-Étienne, netting 12 goals in 31 games. By this point in his career, I was extremely lucky enough to have watched him play twice, once at Nice while he was still a budding youngster, and once for Brest during his stint in Ligue 2. I immediately was drawn to the pure quality of his first touch as well as his ability to link midfield and attack with intelligent passing. In contrast, although it is a harsh view as he was still young, his hold up play was severely lacking and at 5 foot 7, he is hardly designed for a route one system. Furthermore the inconsistency of his finishing seemed to be the deciding factor, potentially halting his growth. As a result, I was extremely surprised when he moved to Griffin Park for a reported £1.6 million in the summer of 2017. For the remainder of 2017 he was condemned to the bench by a massively in-form Lasse Vibe, meaning his Brentford career got off to a fairly slow start. Fortunately for Maupay, Vibe departed The Bees in January for China. He now had a chance to establish himself in the starting eleven. He once again showed his inconsistency, squandering 4 or 5 chances that could have won Brentford the game by a landslide. I was left fearing for his career in England, however he managed to prove me wrong by finishing as the club’s top goalscorer in the same season. He has since started the 2018/19 season on electric form scoring 12 goals already as well as laying on 6 assists for his team-mates. Undoubtedly, he has attracted attention from all around the world, including a host of Premier League clubs. It’s excellent to see him now scoring regularly in a young and learning Brentford side. I hope the recent departure of Dean Smith does not stagnate his career and with January fast approaching, I am praying he doesn’t opt for a rash move to the Premier League, where opportunities might not be as frequent as they are for Brentford. Should he continue this fine form in the second half of the season, I don’t think there is anything that can stop this lad from being a potent force in any league in the world.